I almost forgot it was pancake day last week until I strolled down the baking aisle in Sainsbury’s and noticed the empty shelves and a lot of frantic shoppers wondering what they would do now the pancake mixes had all gone! I always look forward to stuffed pancakes and I have made this recipe for Leek and Mushroom Pancakes a few times. 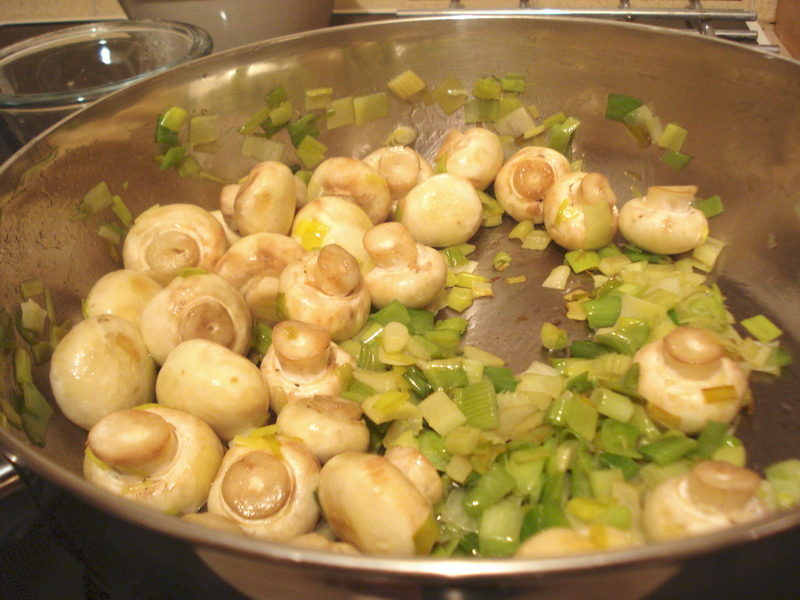 I use spring onions, celery and young leeks together with button mushrooms and for the batter I use buckwheat flour. 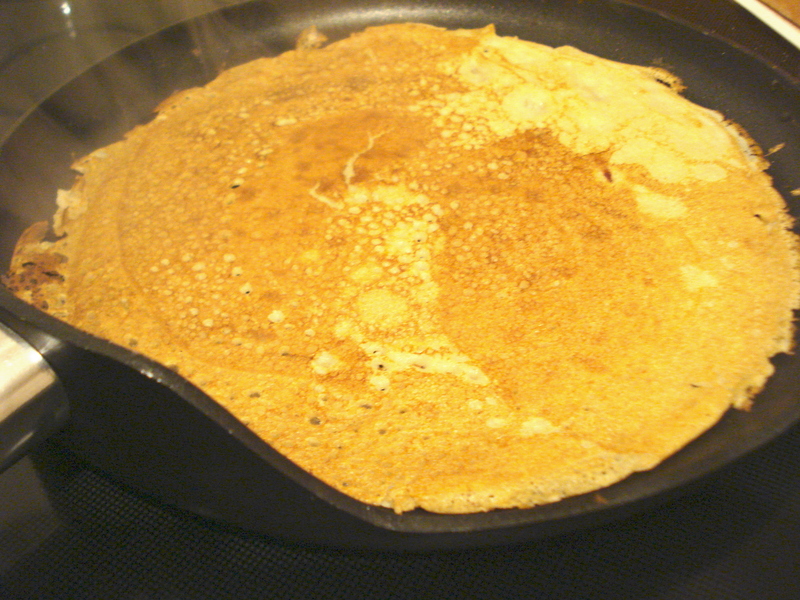 Once the filling is rolled into the pancake I cover them in a white or cheese sauce and sprinkle Parmesan over the top and bake until piping hot and golden brown. On Friday we were both home late so we ended up with good old Egg and Chips with peas as hubby can rustle this up with no help from me. This coming week I am trying to incorporate some of the ingredients already in my cupboards and fridge so I am making a casserole, omelette and soup so I can throw some of the use up items in. Today is Monday and we are on track so far with the leftover Lentil Shepherds Pie. I will be using any bits of salad still in the fridge rather than buying any fresh, I know I have a little gem lettuce, cucumber and radish as a base and also a few tomatoes so if I add some peas and buy a small tub of coleslaw I think I can call that a salad. If we go to the cottage I don’t want heaps of salad items lying around uneaten over the weekend. As the weather is becoming warmer we will soon be leaving the winter recipes behind and I will be looking at lighter fresher foods and hopefully I will be looking at a lighter fresher me as I believe from the scales that I have gained 3 lbs over the winter months! 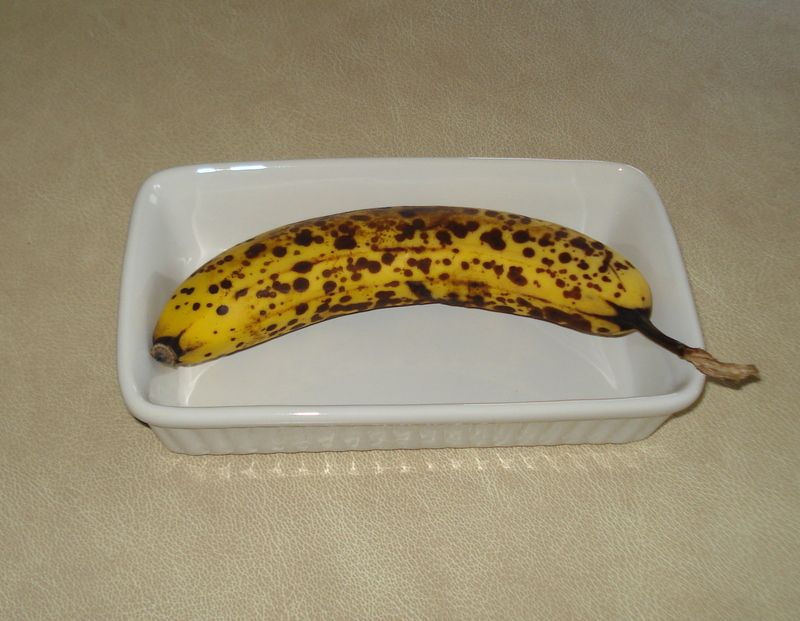 This entry was posted in Menu Plan, Reducing food waste, Using up leftovers and tagged food, Organic food, seasonal foods, Shepherds Pie, vegetarian on March 10, 2014 by wherethejourneytakesme. Shopping day has come around fast – by the time I got to the supermarket tonight I had spent the best part of the day in Leeds trekking up to St James hospital for blood tests then getting the train back to Huddersfield and going to work. I worked until 6 o’clock then walked around to Sainsbury’s in the downpour and stood dripping at the counter waiting for a very welcome hot chocolate! I wasn’t in the best frame of mind for shopping but managed to grab a few bargains. My total spend has taken me over my £50 by £7.05 but I took advantage of some of the offers still on this week. Because the mushrooms were such a bargain I will be amending my original menu plan to incorporate two mushroom meals one of them a Stroganoff. The cheese I will grate into a container and freeze. The chocolate is also a bargain and I have bought this ready to make chocolates for Easter. The bread I had sliced and this will go in the freezer. 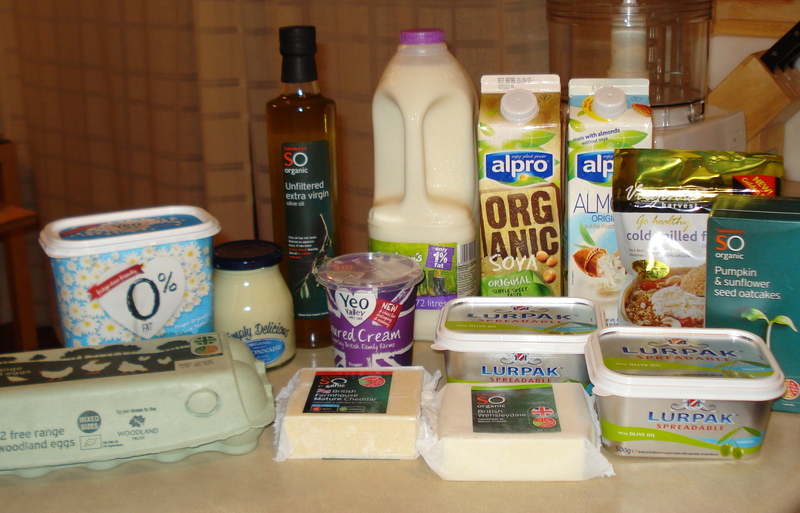 I am building up a nice stock of some items that have been on offer for a few weeks – cereal, cheese, soya milk so that when the offer finishes they should last me a while hopefully until they are on offer again! We still have a lot of food in the cupboards but until the threat of snow disappears I am not going to run my cupboard stores down just in case. We never got to make the curry last week and I had to adjust the menu plan to fit in with the fact we came home late on the Wednesday and Saturday. Wednesday we had Pizza as I bought 2 Marguerita Pizzas for £1.59 with salad and Saturday good old Egg and Chips. I made the curry on Monday evening and we ate the rest tonight. Lovely hubby made a big pan of soup on Sunday for lunch and so I have been able to take this to work for 2 days. I also bought a crustless Quiche in Sainsbury’s which I will take for the next 2 days and have with salad – this will save me £8.20 on my lunches. This isn’t the most exciting menu but it will use the cheap mushrooms and the left over courgettes from last week. I haven’t planned to try out a new recipe this week as I know I will be a bit short of time. Hopefully I will be able to keep to the plan this week but I can recommend making a plan to anyone who wants to save money and reduce waste as even a very loose plan is better than none. It helps to focus on making the best use of the food already in the cupboards and fridge and reduces the amount of fresh food that is wasted if it doesn’t get eaten in time. I find with careful planning I buy fewer veg – but what I do buy we eat at its best and I am not ‘guess’ buying only to find I have over bought. This entry was posted in Menu Plan, Offers, Reducing food waste, Reducing the Spending, The Weekly Shop and tagged Lentil Curry, organic veg, Sainsbury, Shopping, Store Cupboard on February 25, 2014 by wherethejourneytakesme. 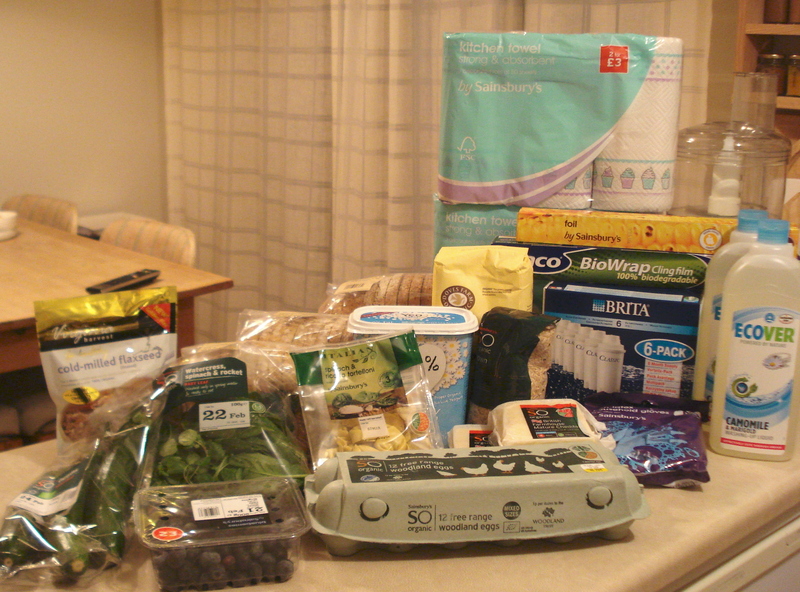 This week I spent a hefty £57.95 on groceries and a further £13 on Britta water filters, (half price for a box of 6). As I thought I didn’t need very much shopping this week I was a little surprised at the amount. 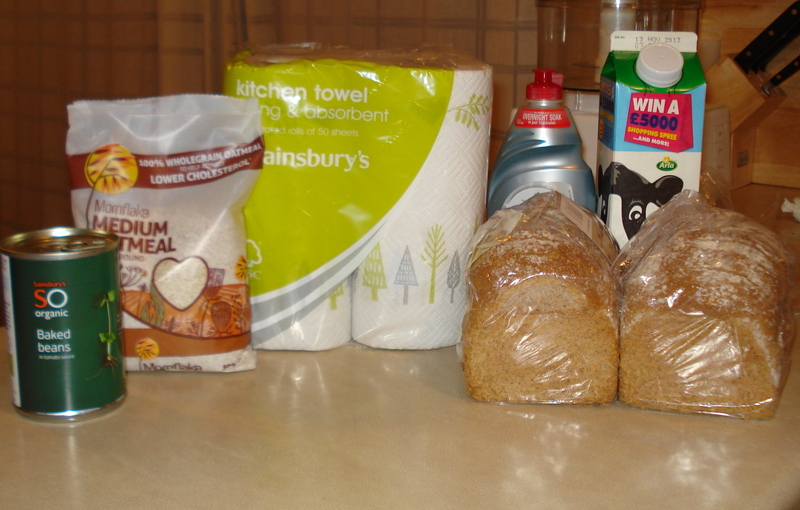 I saved on the offers on Ecover washing up liquid, cheese, bread and Kitchen towels. My lunches at work were dearer this week than last. I only managed one lunch taken from home and the rest I bought at a cost of £9.04. I also bought two bottles of supplements – Vitamin D £8.79 and Acidophilus £7.55. I haven’t been taking these for a week or two and my plan is to take them every other day as a compromise to try and save money on these over the year as this is definitely and expensive category in my budget. 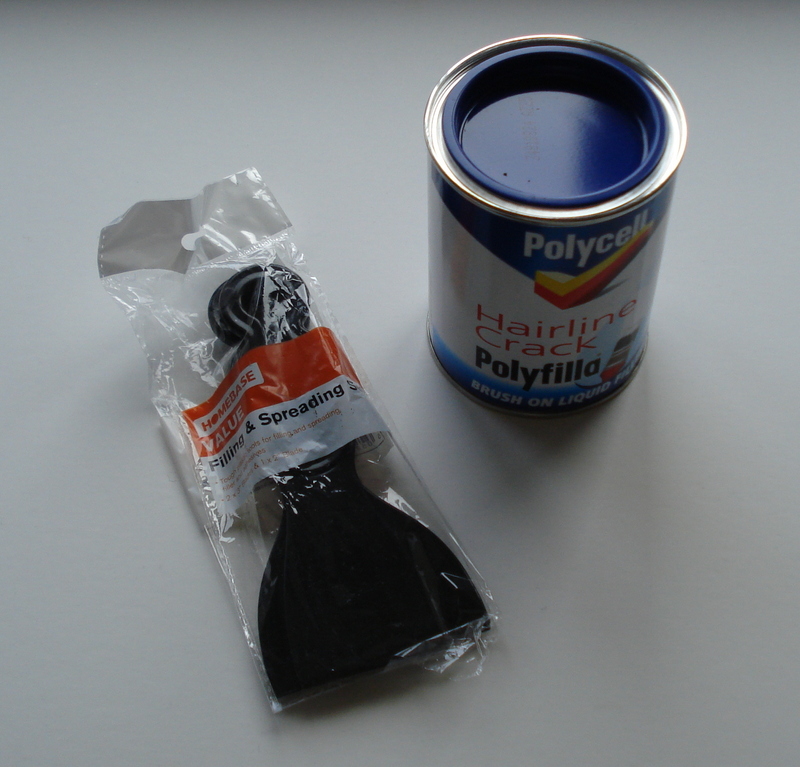 I spent a massive £34.72 in the stationery shops – Staples and Rymans. I am working on simplifying our home office at the moment and I am changing one or two of my systems for keeping track of all the paperwork. So as well as decluttering I am also spending some money here to try and improve the set up. 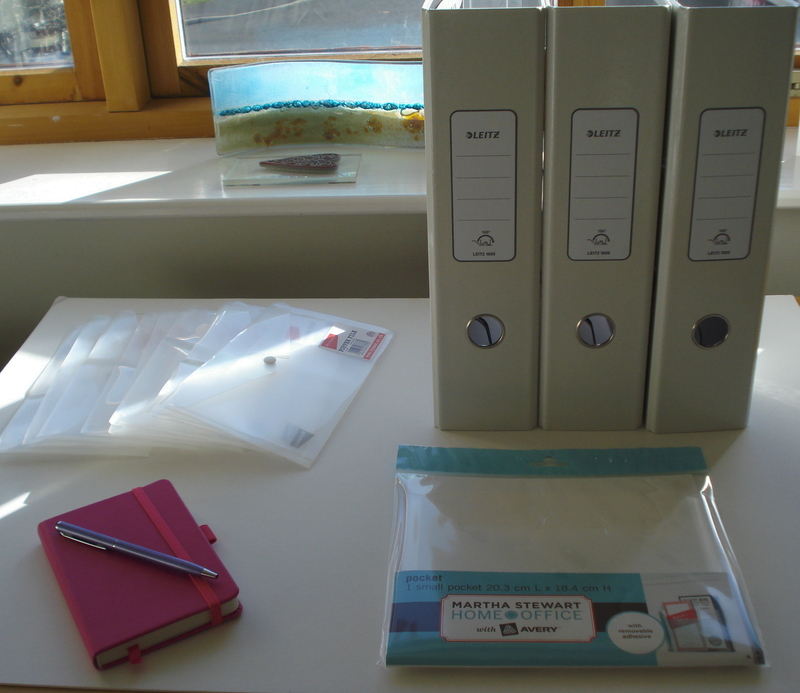 I needed to renew my 3 lever arch files which have worn and split due to continuous use. 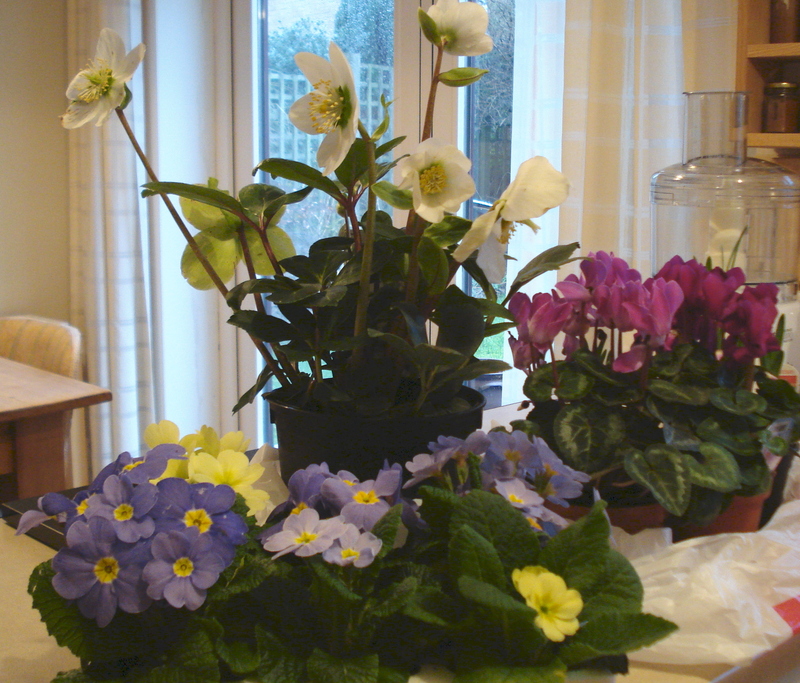 I managed to get some new ones at half price and they are sturdier than the old ones so should last longer. 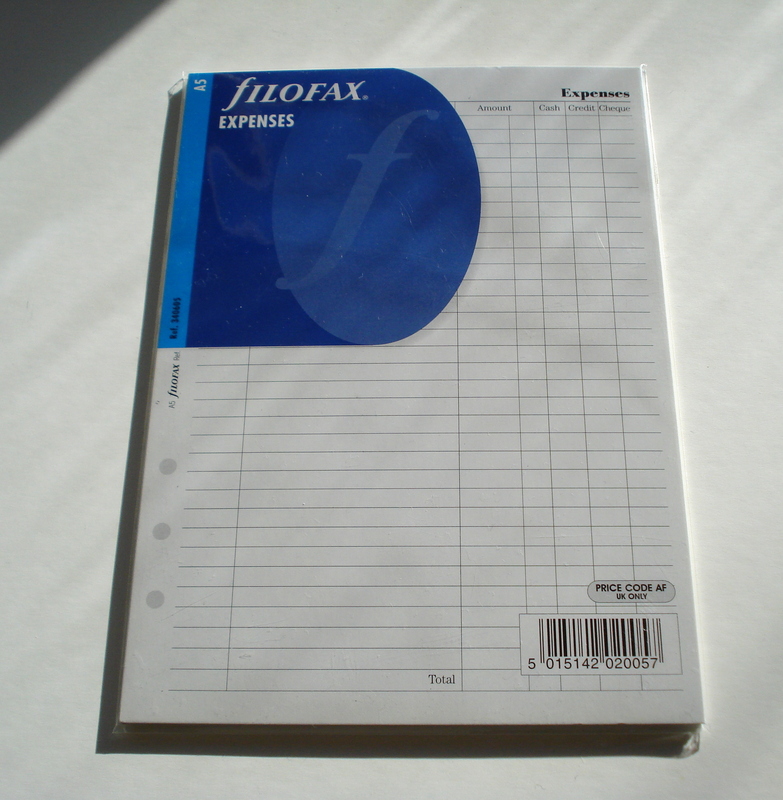 I use one for filing my papers that relate to my bill account, one for my bank, credit card and savings statements and a third for my mum in laws paperwork. However, I decided this week that I would begin a separate fourth file for my savings statements and remove them from my bank statements file as it is an expanding section which is overloading the file. 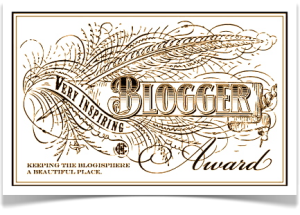 I will be doing a post soon about Simplifying our home office and all will be revealed. Meanwhile this coming week has to be a no spend /low spend to compensate for last week. There are only 5 days left in February and although I have overspent in Stationery and Supplements I am still within the whole housekeeping budget because my food spending is only £115.95 so far for the month. Tomorrow I will post my coming weeks menu plan and review last weeks. This entry was posted in Reducing the Spending, The Weekly Shop and tagged food, Sainsbury, Store Cupboard, supplements on February 23, 2014 by wherethejourneytakesme. Now my January Financial Focus has finished over on my other blog where the journey takes me all posts about reducing my spending will be appearing here as this is where I log my weekly spending. 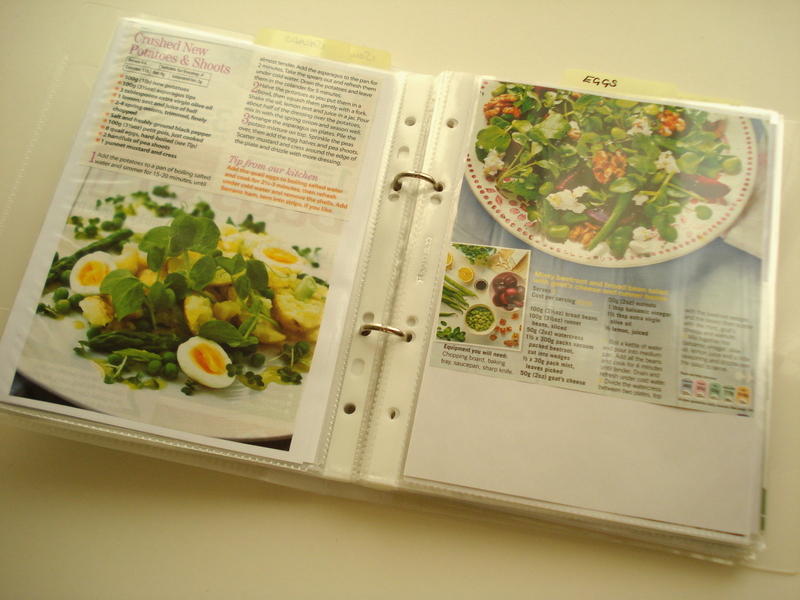 I have been reviewing our meal planning this weekend – in fact not just reviewing but resurrecting! Whilst I was focussing on our finances last month I put very little thought into our meals and this can end up quite wasteful. 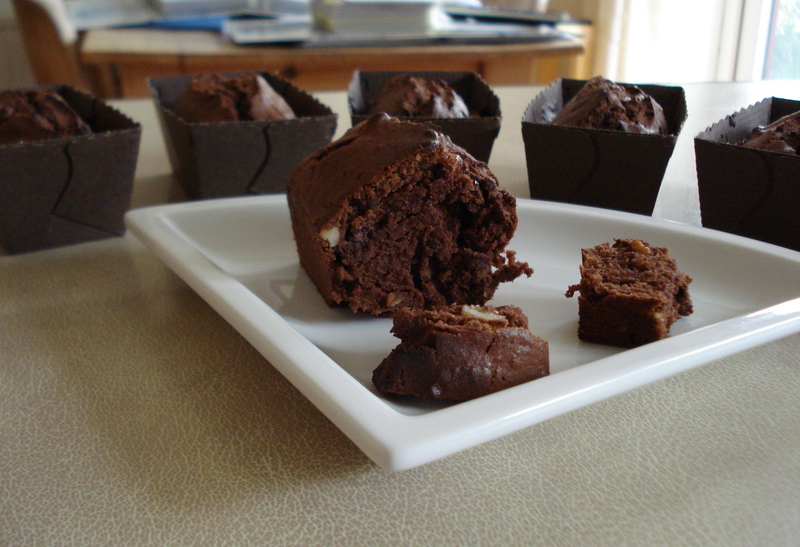 I have decided that I must make an effort to use more of my recipe collection and get rid of the ones that we either do not like or have been a complete disaster so I have been compiling a small folder of recipes that are both firm favourites and a few new ones to try. I am also looking to take more packed lunches to work, my favourite being soup or salad rather than sandwiches. I am aiming for 2 packed lunches out of the four days. 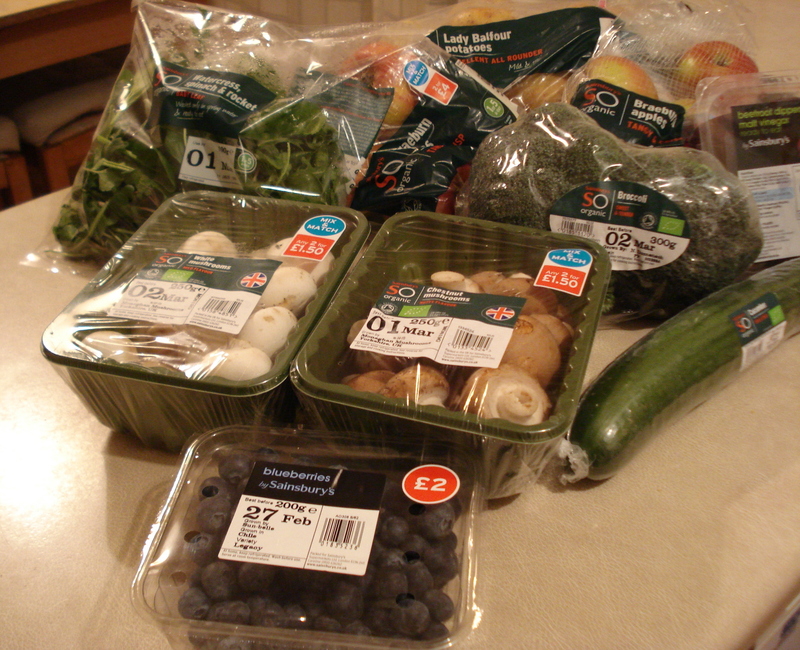 So firstly a review of my fridge and cupboards as it is a while since I did a stock take. Some food items seem to come and go quickly and others linger forever in the back of the cupboard waiting for what I am not sure! Perhaps it is waiting for the right recipe, the right season, a specific other ingredient or just for me to notice it! 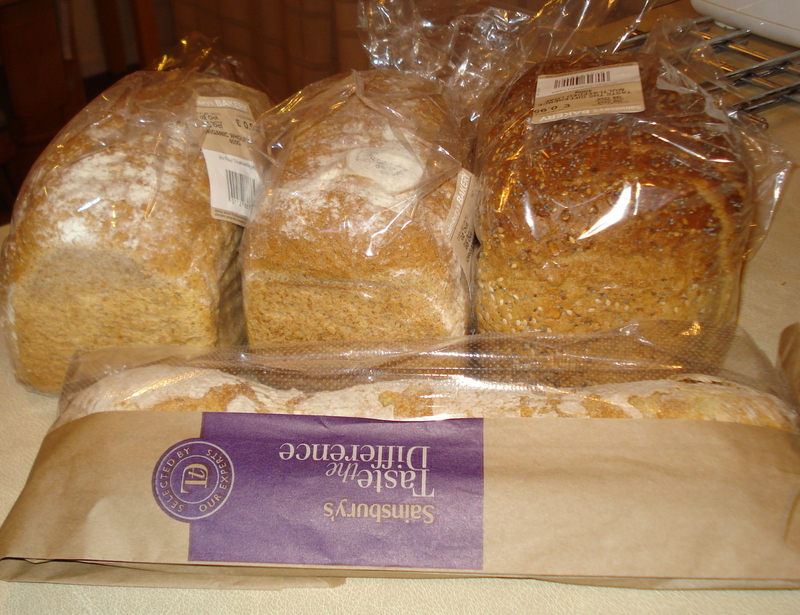 I do like to keep a bit of an emergency stock in my cupboards during these wintery days when snow can render me almost housebound overnight so it is not wise to play Old Mother Hubbard and run the food supply down too far – I will save that for the better weather. So it doesn’t look like I will have much shopping to do this week other than the basics! 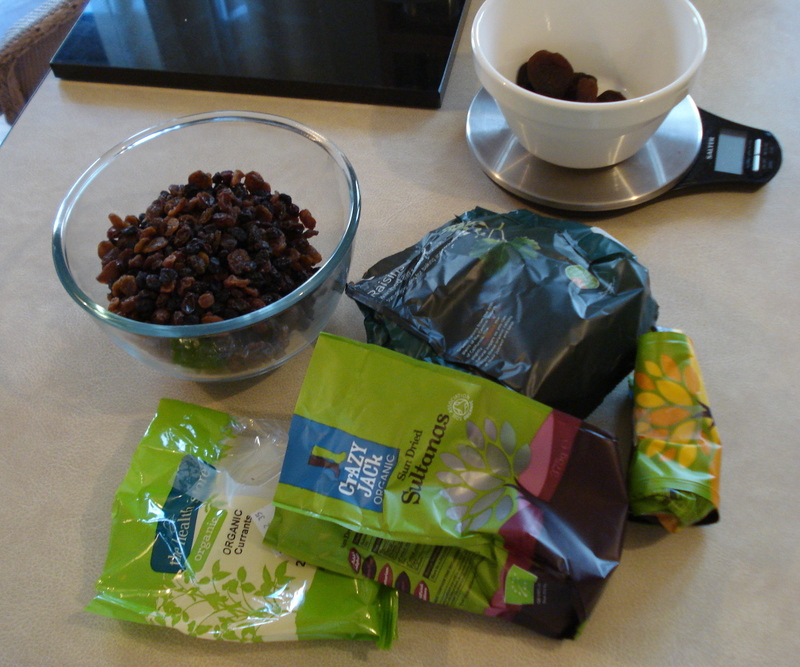 As I have a number of eggs to use up I will make a Farmhouse Fruitcake this will also use up the remains of the dried fruit from Christmas I had about 10 oz in varying proportions and I added dried Apricots rather than candied peel. I can also make some little ramekin Crumbles with the jar of Bon Maman Cherry Compote so we can top them with the end of the sour cream. 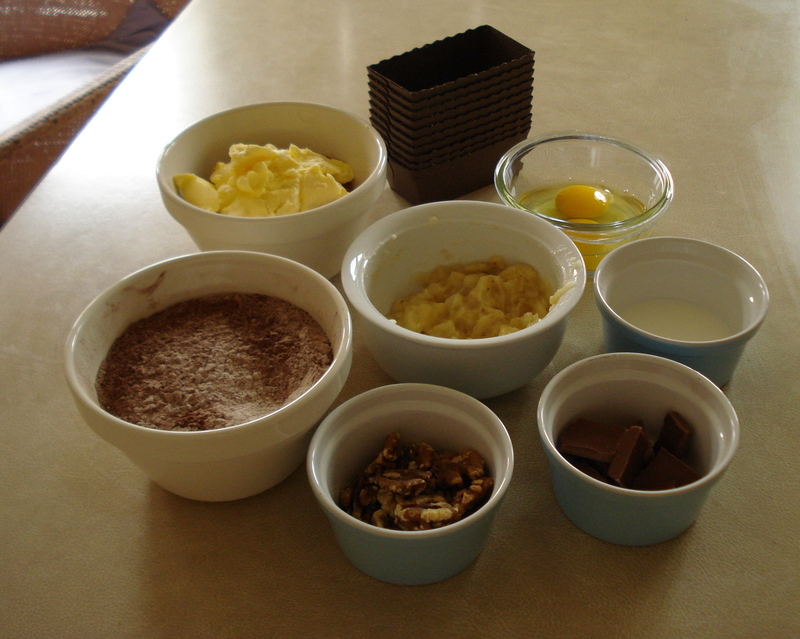 The remaining crumbles can be frozen for another day. Frittata would be good today to use the rest of the eggs. I have a new recipe to try – Red Pepper and Courgette Frittata. I can use up the little gem lettuce and cucumber and cook a few frozen broad beans and salad potatoes and make potato salad. I will need to buy a few tomatoes. Any leftover salad and potato salad I will take to work with some bread and butter and a little cheese. Shopping Day after work so a quick meal tonight and pasta is easy. There won’t be any leftovers for work though. I can use up the carrots, courgettes, celery, onions and add a few potatoes. If I make double the amount we can have it another night with Taco shells. Whilst cooking tea I will boil an egg for tomorrows lunch and make egg mayonnaise sandwiches with fresh watercress. 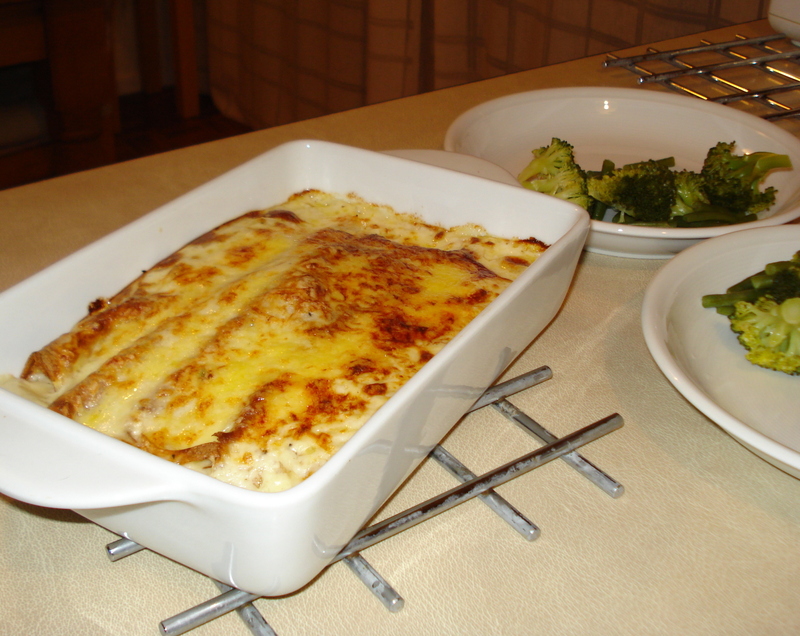 I have a ‘Leaving do’ tonight and will be eating out so I will buy a pack of fresh ravioli pasta for hubby to cook with cheese sauce – he can make this in 5 minutes flat and add peas if he wants to make it more healthy! A nice easy leftover meal tonight so I could use the time I would normally take to cook tea to make soup for the weekend and work next week from all the leftovers. 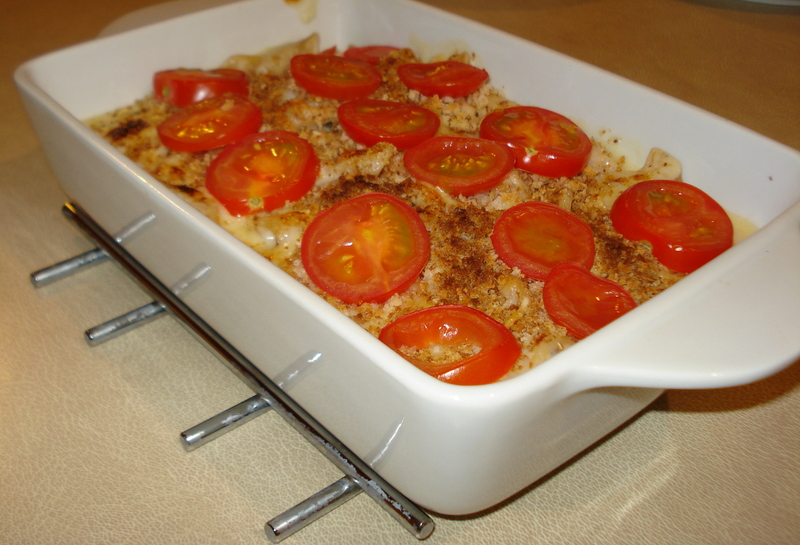 Another new recipe to try – once opened I will need to look for another recipe to use the remainder of the Halloumi cheese next week. This is a fairly quick accompaniment in case we go out or get busy. The potatoes can be put in the oven on automatic. I can add a pack of Red Kidney Beans to the Ratatouille for extra protein. 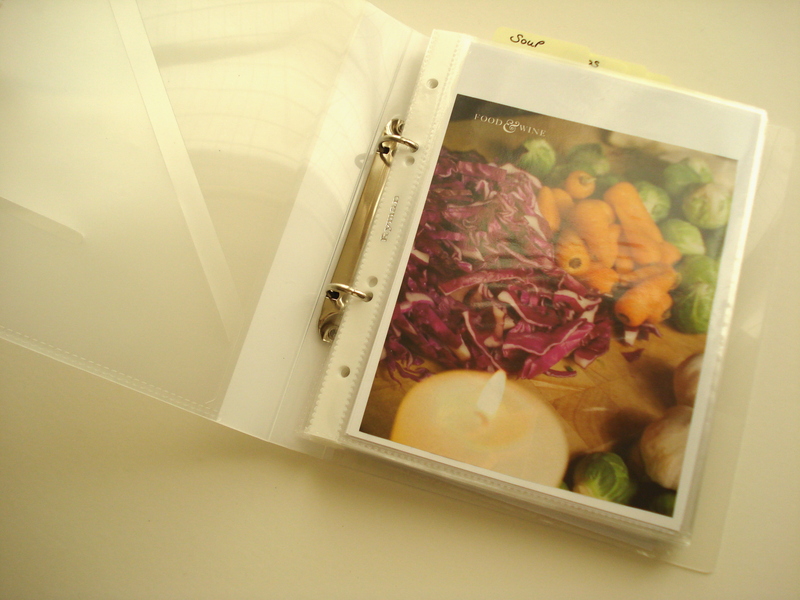 How are you doing with your menu planning do you find it helps keep the grocery spend down? 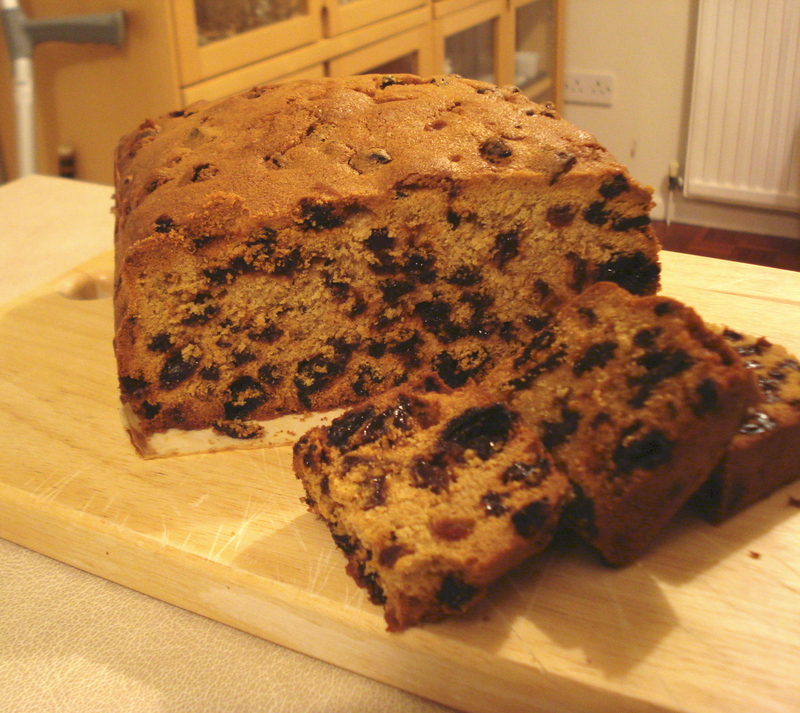 This entry was posted in Menu Plan, Recipes, Reducing food waste, Using up leftovers and tagged Easy meals, Farmhouse Fruit Cake, Fruit and Vegetable, Halloumi cheese, Store Cupboard on February 16, 2014 by wherethejourneytakesme. I haven’t been here for a while but it is good to be back and yes I know I need to update my header for 2014 but that will be coming soon. Last year I did make a big effort to cut the grocery budget and even though it wasn’t as much as I wanted (£10 a week over my budget of £50) it did make a big difference over the year against my previuos £70-80 week. The weeks that I managed to write a menu plan in reasonable detail and stick to it helped to lower the costs substantially as did buying items only on offer, unless we were absolutely desperate. I work four full days a week so I can’t put heaps of time into this exercise but the new habits I did put in place have continued. So this year I will be building on last years success. Of course it will get harder as I am starting from a different place where the many obvious and easy savings have already been tried and tested. Finding new ways to save money can depend on a number issues and for me eating organic is not negotiable even to save the pennies, whereas trying a different supermarket or method of shopping might be. For anybody reading this who thinks that being frugal or thrifty is about a choice rather than absolute necessity they are quite correct in my case, it is a conscious choice. Even though we had a 25% wage cut for the last 3 years we are not surviving on the bread line like some households – however, I would say that there is no room for frivolous spending or throwing money away needlessly, especially as retirement is looming on the horizon and we want to make sure we have enough put by not to be a burden on anyone else, including the state. We also want to be able to enjoy our older years when they arrive. Another reason for the mindful thrifting is I hate waste or buying for the sake of – it seems like an insult to all the starving people in the world to be throwing any food stuff away. My main and only reason for throwing food away would be for the safety aspect and by this I mean if I wasn’t sure if a food could still be eaten beyond the stated use by date without undue harm. I will often stretch some foods beyond the use by unless it has mayonnaise in it like the deli pots of coleslaw then I take extra care. Fruit and veg dates I completely ignore and I just use the visual test – if it is shrivelled and bearing mould it becomes compost. This is not often though as I tend to make soup with any remains from the week. Planning menus wisely does overcome this tendency to end up with a pile of items in the fridge at the end of a week that have only had a spoonful removed and have since exceeded their use by and beyond. So of all the ways of saving on the grocery spending I am going to concentrate on the menu planning as I believe this is the one thing that promotes both a balanced meal and big savings on food waste and food cost. Having said all that I ended up in Sainsburys tonight without a list or a plan, the shopping expedition was a feat in itself, battling not with snow today but with the strong winds and lashing rain. Sainsburys had to close off their automatic doors at one point. I had no choice but to do a bit of a trolley dash so I could get on my way home. I decided tonight was not the night to be exceptionally frugal with the groceries and although I was by no means stockpiling I made sure that we have a good stock of items to tide us over should the snow return. Bare cupboards are fine if you don’t get marooned. 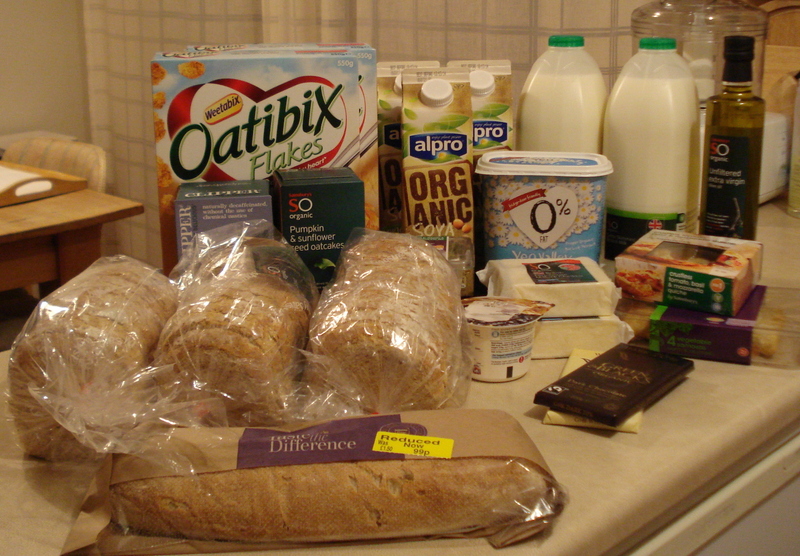 So here is the grocery spend £62.01 to be precise less £13.50 reward points – I found a few items on offer – to the right of the photo. So now I must set to and plan the menus around the shopping for this week – in fact I hope I can stretch this amount of food to a fortnight or maybe longer. How is your food shopping / meal planning going so far this year? 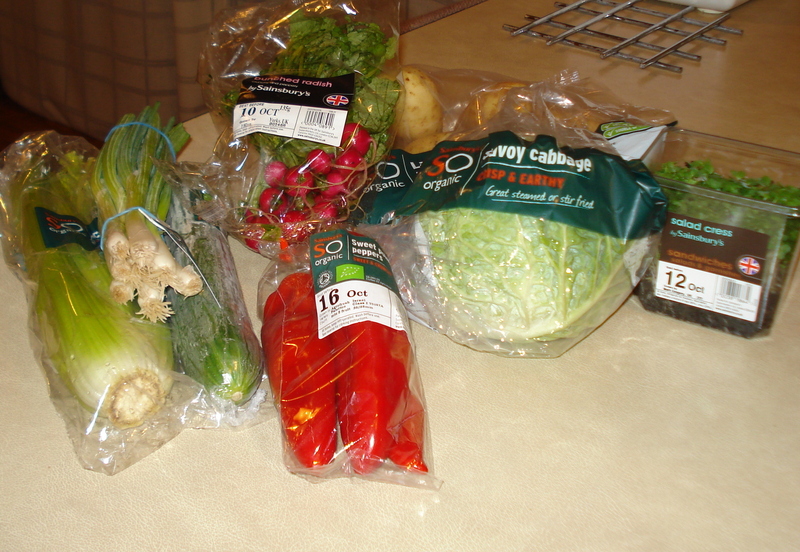 This entry was posted in February Challenge, Reducing the Spending, The Weekly Shop and tagged food, Food waste, Sainsbury, Shopping on February 12, 2014 by wherethejourneytakesme. And just in case you were wondering – I confess to spending a total of £19.53 on magazines – my target spend in this area should be zero. Overall I am quite pleased with the results – the toiletries were a bit of an outlay but I won’t need to buy face cream for a long time. Areas for improvement – definitely magazines, closely followed by those lunches at work, however it should be noted that my grocery spend would go up slightly if I took lunches to work from home, so I wouldn’t be saving the whole of the £25.66 I spent. 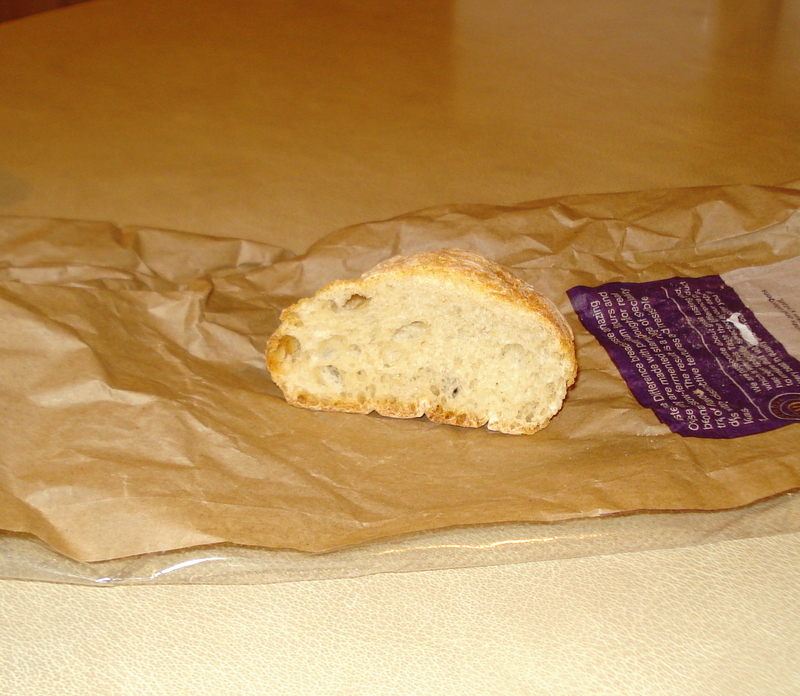 An easy adjustment to make will be to take my own bread – which I did do this week saving me £2.68 a week. As I did very well the week before last by only shopping for what we needed during the week and not doing a big shop I am going to try this again. So I will do a bigger shop once a fortnight and then buy as I need on the alternate weeks. I had 3 birthdays this month for special friends and on Sunday I made a card for each of them – (pictures of these will be over on my other blog where the journey takes me soon) saving me about £6-£7. In November I have 4 birthdays and an Anniversary so my aim is to make these in October as well as beginning to think about making for Christmas. They didn’t even get as far as having the chocolate topping! 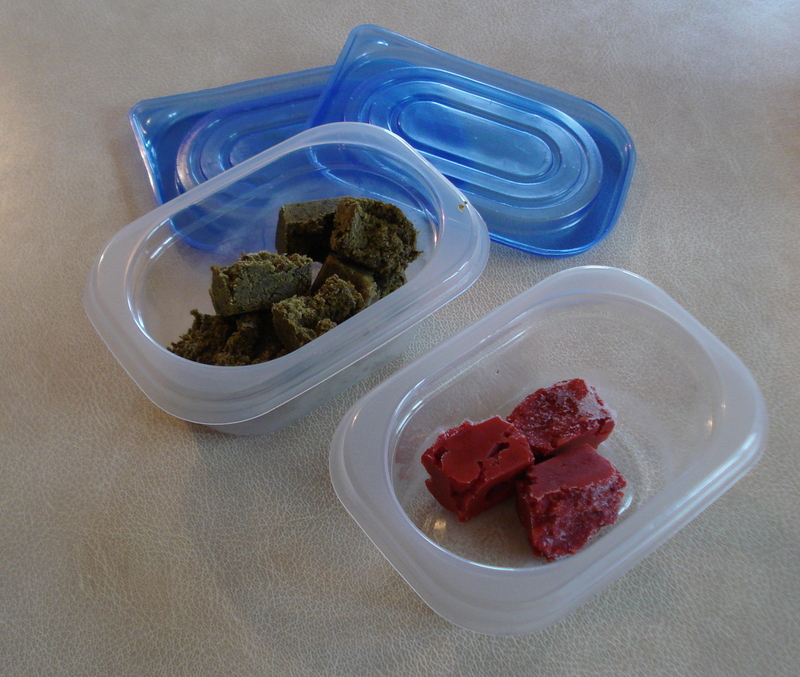 and remember I froze the ends of tomato paste and some Barts Mediterranean Herbs in the ice cube trays which I have now transferred into my storage tubs ready to use. On Wednesday I had to go to the out of town Sainsbury’s for Petrol and I called in to get a few items – but not to do a big grocery shop. Luckily I did the shopping before I bought the petrol so I was able to get £0.8p per litre off the total with the voucher I got for spending more than £20 on their clothing range. 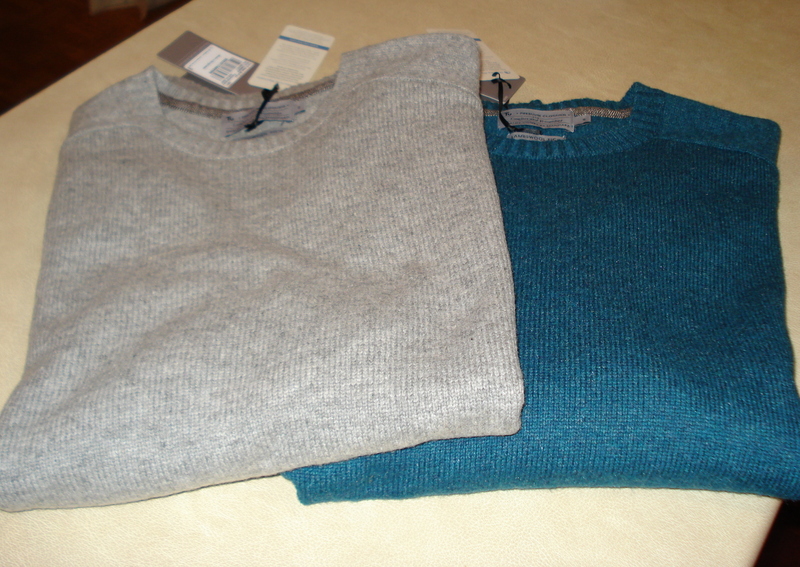 This is what I got for hubby dear – 2 wool jumpers @ £20 each which I didn’t think was bad and I brought a pair of leather boots home to try (not pictured) price £40, however all these come out of our clothing budget. I spent £22.27 on groceries and veg for my planned meals and items we had run out of. 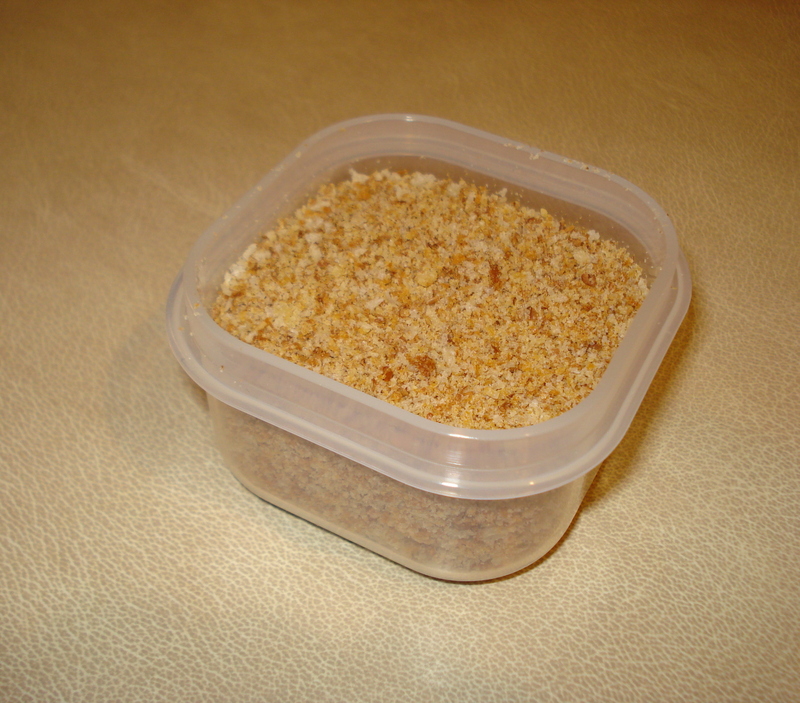 The Oatmeal is ready for making some Parkin. 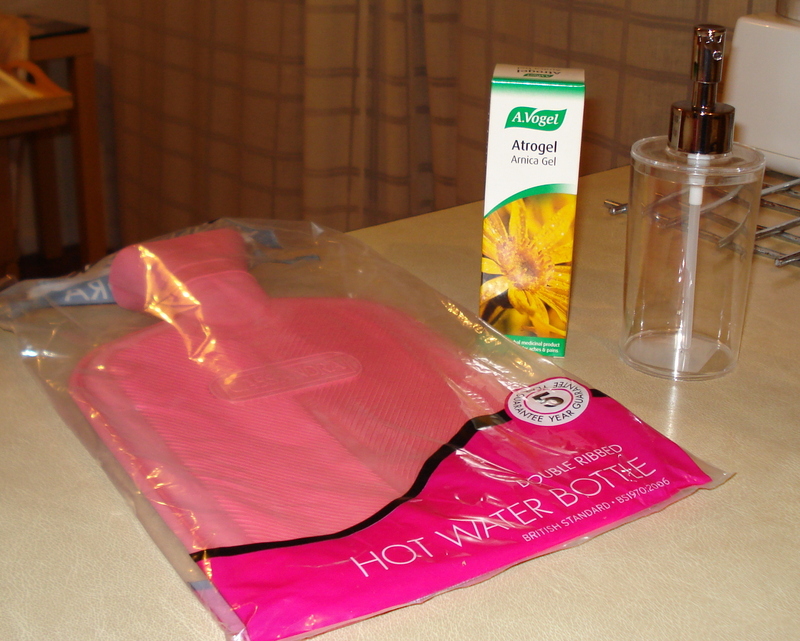 I also took advantage of one or two bargains – I know the weather is only just starting to turn but I do not possess a heated blanket or have a microwave to heat up a wheat bag so I treated myself to a brand new Hot Water Bottle £5.99 (every girls dream eh!). Actually I put two in my mum’s bed when she visits and one of my old ones sprung a leak on me recently so this new one is just what I needed. Then it happened…unexpected item in the bagging area!!! 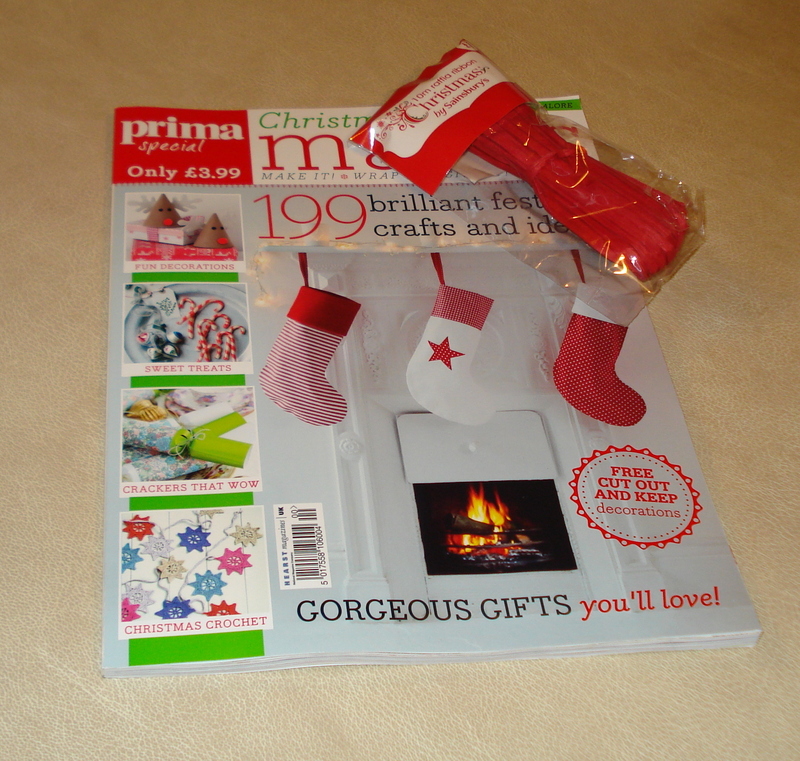 Well I never said no magazines meant no Christmas Specials – Prima Xmas Makes £3.99…and the red raffia – just what I need for my Christmas parcels £1.00. My total spend at Sainsbury’s was £119. 41 with £80 of that from my clothing budget. So that is the week so far – I have still to get through Friday, Saturday and Sunday but I should not need to spend any money on food shopping. I am now going to snuggle down in bed and browse through my Prima Xmas magazine looking for Christmas ideas. Have a lovely frugal weekend. This entry was posted in Menu Plan, October Challenge, Offers, Reducing food waste, Reducing the Spending, The Weekly Shop, Using up leftovers and tagged Chocolate, Tomato paste on October 10, 2013 by wherethejourneytakesme. If you have been following along you will know that my challenge for September was to use up the food in my store cupboard, spend a lot less on groceries and reach the end of the month without using any of my pay that was deposited into our bank account on the 20th September. Well it is good news – my bank statement shows that I did manage to get to the end of the month with my pay intact and £30 to spare this is largely due to my efforts to plan our meals around the items in our store cupboard and freezer and only buy in necessities. So far this week it has been very boring on the meal front though luckily everything up to today has been very quick and simple as time was a bit in short supply. 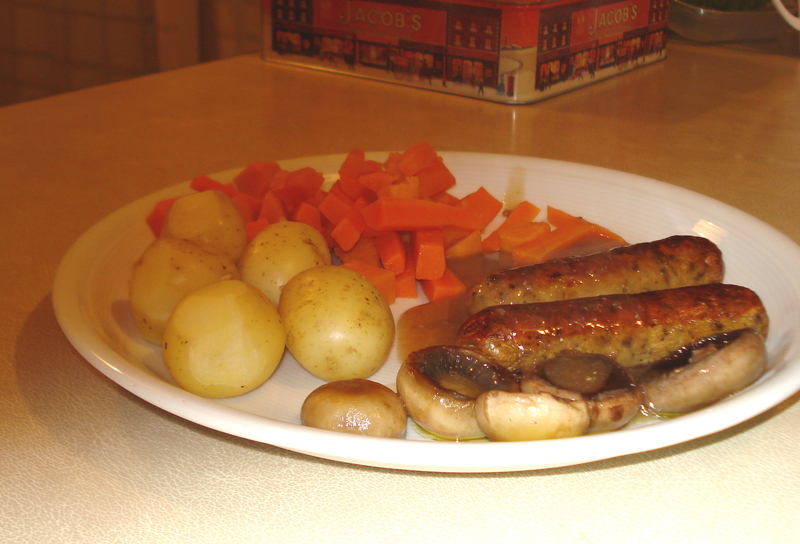 I planned the meals around all the ‘need to use up items’ lurking in the freezer – you know all those odds and ends that are often not a complete meal by themselves and by Thursday we sat down to a rather strange combination, which I decided was even too odd to photograph. Hopefully from today the freezer is almost empty of the ‘bits’ and we can return to preparing something a little more exciting. Tuesday – Higgedy Spinach and Feta pie from the freezer served with little potatoes the last of the packet frozen broad beans and the 2 remaining carrots. Wednesday – Pizza base from the freezer, topped with last of the open jar of stir through tomato sauce that hubby had on his pasta last Friday evening, mushrooms, grated cheese from freezer, served with peas. Thursday – Sainsbury’s frozen veg pie and a Pea and Mint rice cake – both had half each as neither could decide which one to have! 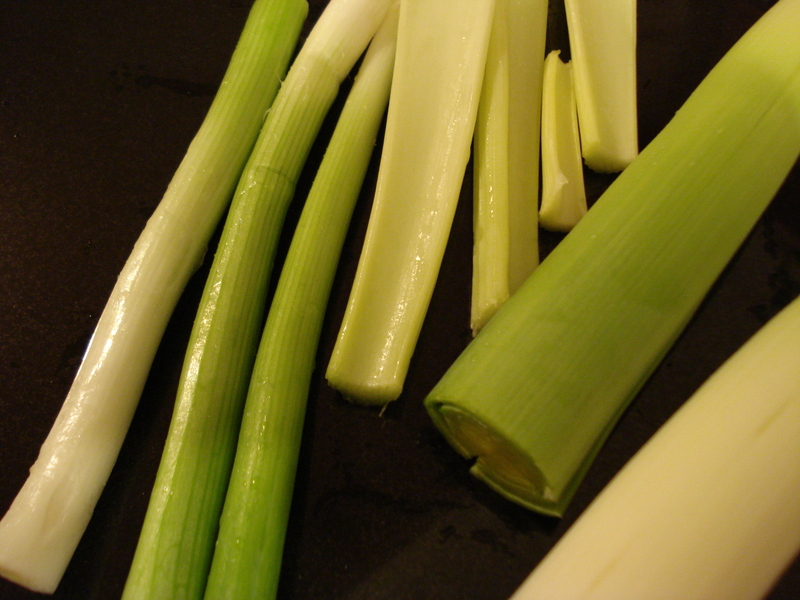 – served with little potatoes and fresh French beans. 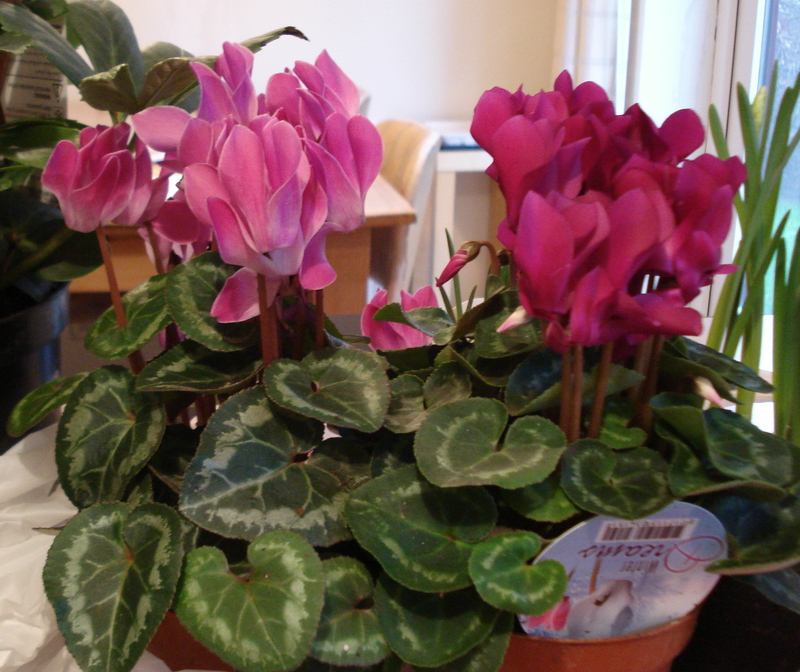 It was decision time all the way around the supermarket and I was exhausted by the time I hit the tills because although I had planned to only buy exactly what we needed for the week and no more I hadn’t bargained for the bargains so to speak! First of all I needed a pack of butter, however it was on offer so it seemed more cost-effective in the long run to buy the 2 for £5 saving £1. This was repeated on the milk, the bread and the cheese. Then I had to buy one or two items we had almost run out of that are expensive like the organic, cold pressed unfiltered virgin Olive Oil £3, a jar of organic Mayonnaise £2.50, a packet ground Flax seed £2.40 and a dozen organic mixed size eggs £3.60. I also needed some items like frozen peas that we were completely out of but I could not find an offer on these so had to pay full price. I spent £59.86 on the groceries £14.64 of this was for those extra 2 for so much offers so you might say this week was £45.22 for the items we really needed. My target is now £26.96 for the remaining weeks of this year so I am £18.26 over budget. Yep this is where I fell down – mooching round the clothes (not a good idea) I saw they do the soft cord leggings I bought in Maroon a while ago in a Navy (not pictured) – so in the trolley they went – cost £14 (but out of my clothes account). Then walking through the Housewares department (another bad idea) I noticed that plain white Egyptian pillowcases with a high thread count were on offer £6.66 for 2 cases – a bargain and much cheaper than the John Lewis ones sold singularly, maybe not quite the same quality but I only want them as a pillow protector under the proper ones. 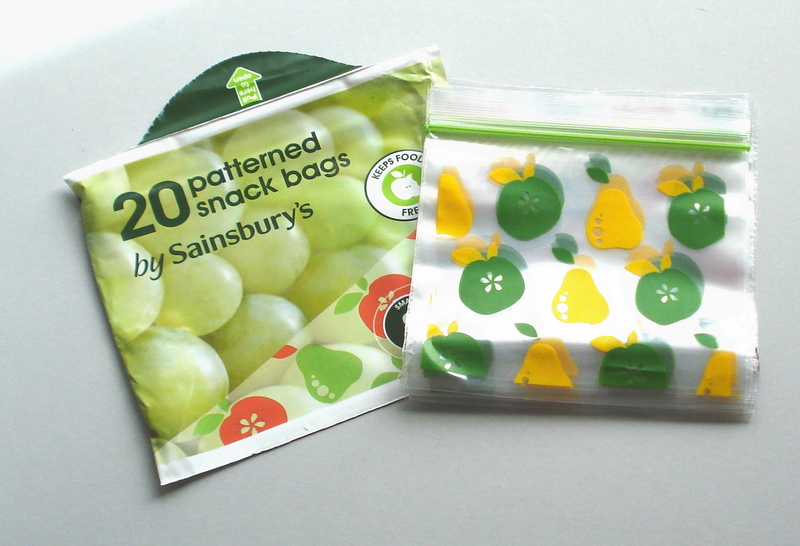 The sandwich bags were on offer and don’t you just love these little patterned snack bags – obviously not a good seller as they are being discontinued for the knock down price of 75p. I thought I might use them for my craft bits and bobs and freezing small amounts of herbs. And did I mention the magazines? They kind of leaped off the shelf and into my trolley. 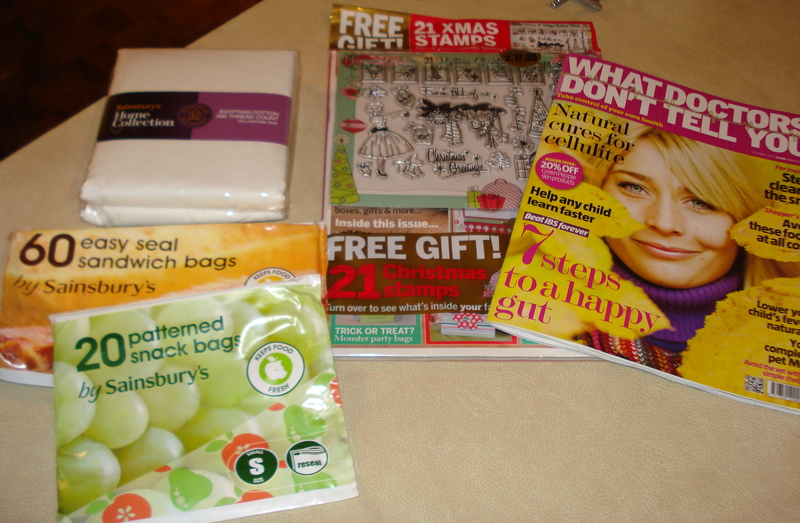 The card making one had a free offer of clear rubber Christmas stamps, which I know I will use for cards etc even though I am not keen on the actual magazine – £4.99. The other magazine ‘What doctors don’t tell you’ cost £3.95 and is my way of keeping up on any healthy foods and new research that might be of interest to keep us healthy into our old age! Did my cash spending for the week go any better? I went to draw out my £10 for the week at Sainsbury’s cash point and like last week found that they no longer appear to be dispensing £10 notes – they start at £20. Shame on you Sainsbury’s encouraging me to overspend! Despite the overspends I am pleased to have used up some of the foods in the cupboard and freezer and will continue to do this. Not doing a weekly shop last week certainly saved a lot of money and I might consider doing my bigger shop once a fortnight. I will keep you posted on this. 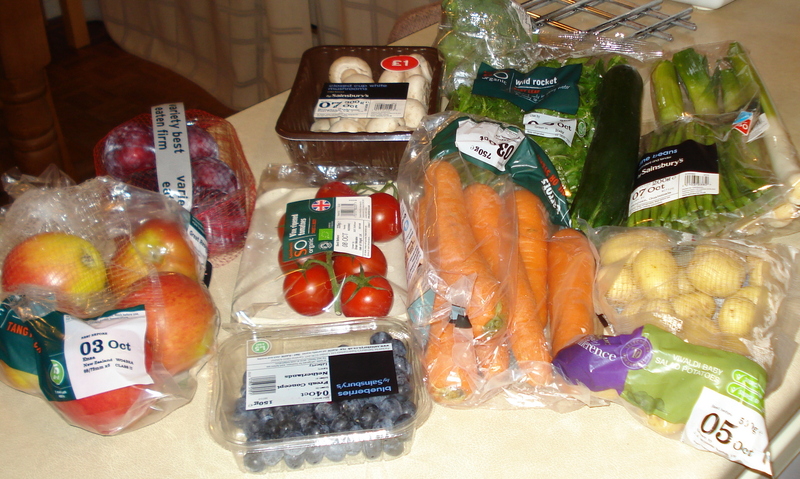 This entry was posted in Menu Plan, Offers, Reducing food waste, Reducing the Spending, The Weekly Shop, Using up leftovers and tagged Groceries, Ocado, Organic food, overspending, Sainsbury, September on October 4, 2013 by wherethejourneytakesme.